Hannah Wingfield (1788–1870), who provided half the costs. Her husband, Charles Wingfield, was appointed Surgeon of the Radcliffe Infirmary in 1817 and remained in the post until his death from cholera in 1846. The Revd John Rigaud (1823–1888), who collected much of the rest of the funding. He was the fourth son of Stephen Peter Rigaud, Savilian Professor of Mathematics and Experimental Philosophy at the University of Oxford, and was brought up in the Radcliffe Observatory. He was a Fellow of Magdalen College from 1849 to 1888. William Wilkinson (1819–1901), the architect whose buildings included the Randolph Hotel (completed 1864) and the Norham Manor estate in north Oxford, designed the convalescent home and charged no fee. In the 1860s the Revd John Rigaud at first campaigned for a fever ward to be built in the grounds of the Radcliffe Infirmary and managed to interest his friend, the wealthy widow Mrs Hannah Wingfield, in the project. 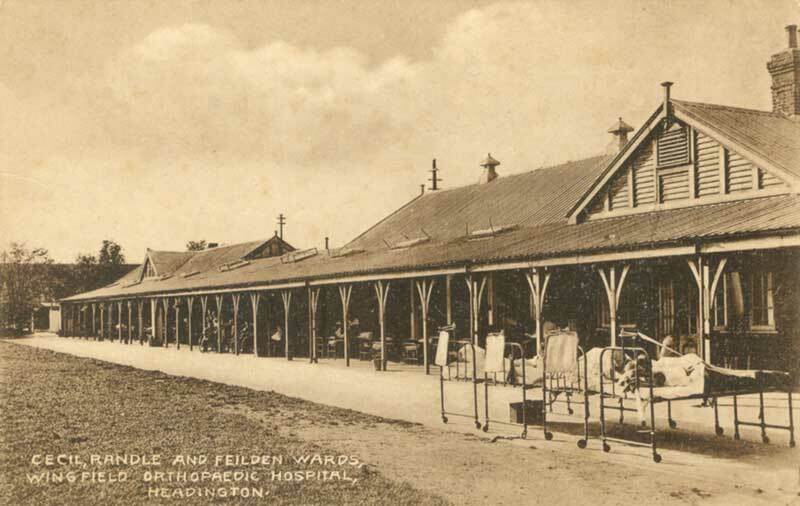 But Rigaud changed his mind when it was proposed that members of the University should be allowed to pay for beds in the fever ward, and so he transferred the money so far collected to another of his projects, a convalescent home in the “pure air of Headington”. 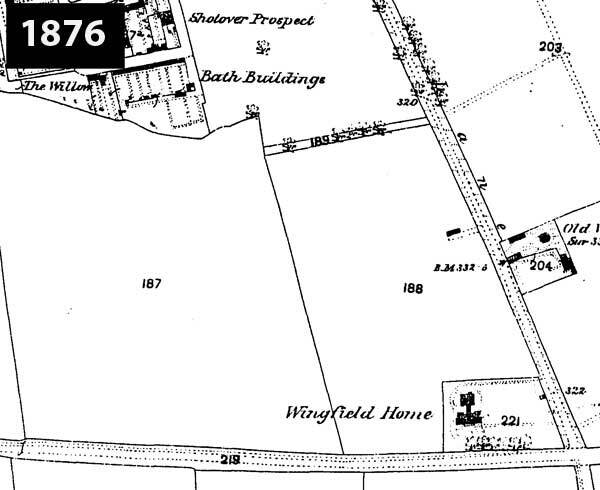 Mrs Wingfield gave £2,500 which provided half the costs of purchasing an 18-acre site on the corner of Old Road and Windmill Road from Magdalen College; the building and equipping costs; and some money to endow it. John Rigaud collected smaller contributions from friends and colleagues in the University, and the first list of subscribers contained the names of 25 heads and fellows of colleges and local clergy. 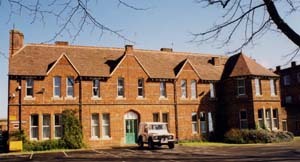 The building, which is of red brick and Broseley tiles, was designed, free of charge, by William Wilkinson (who as well as designing the Randolph Hotel in 1866 and many Gothic-style houses in north Oxford had also designed Headington Workhouse in 1836, and was to design the bridge over Headington Hill in 1877). The convalescent home was built by Thomas Jones of George Street at a cost of £1075. See The Architect 7 (1872), 306. It was designed to accommodate eight men and eight women who were well enough to leave the Radcliffe Infirmary but were not fit enough to go home. This institution was formally opened on Monday last, Whit-Monday, by Archdeacon Clerke, who also laid the first stone of the building on that day, 1871. The site of the building is adjoining the road leading from the Warneford Asylum to Shotover, and about a mile from Oxford. Nine acres of land were secured for the purpose by the promoters of the undertaking. The building is erected to accommodate eight persons — four men and four women – and is so arranged as to be capable of enlargement at any future time if necessary. The designs were kindly furnished gratuitously by Mr. Wilkinson, architect, of Beaumont Street, Oxford, who added, what was of the greatest value, his personal superintendence of the work. The house comprises, on the ground floor, a day-room each for the men and women, rooms for the Committee and Steward, separate apartments for each individual, laundry, kitchen,a and the necessary offices, besides rooms for the Matron, spare room &c. On the first story are separate bed-rooms for each. The walls are built with red bricks, and covered with Brosely tiles. 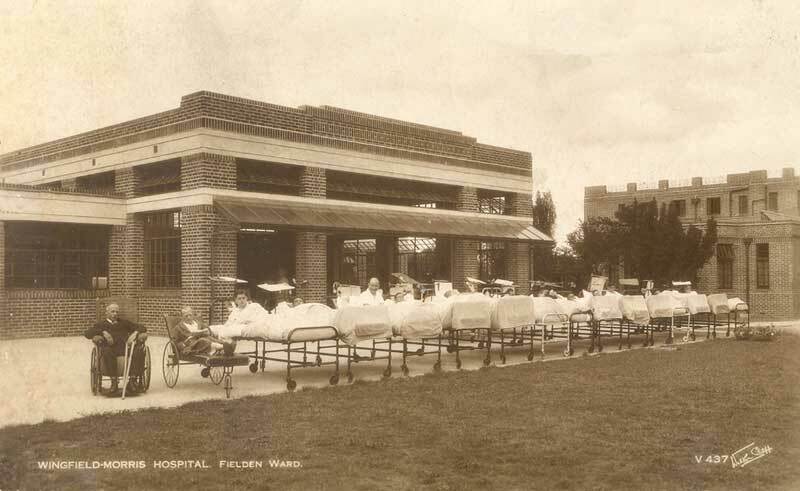 In front of the building is a verandah for the accommodation of patients. The contractor was Mr. Thomas Jones, of George-street, Oxford, and the cost of the building was 1075l. The opening ceremony commenced with a surpliced Choir from Headington, with the aid of some voices from Magdalen College, conducted by the Rev. L. S. Tuckwell, chaplain and precentor of Magdalen College, and Curate of Headington, singing the 232nd Hymn from “Hymns Ancient and Modern”. The Rev. J. Rigaud then read some appropriate prayers, after which the Choir chanted Psalms xci. and cxxi. ; and Archdeacon Clerke then said, “We open this Home for the restoration of the sick to health, in the hope of God’s blessing upon it, and in memory of Hannah Wingfield, its chief benefactor, in the name of the Father, and of the Son, and of the Holy Ghost. Amen.” The Archdeacon added other suitable prayers, and the Choir having sung another hymn, composed for the occasion, Archdeacon Clerke pronounced the Benediction, and the proceedings terminated.– The weather was very fine, and there was a large number of people present. The company then partook of lunch. Among those present were the Rev. Canon Mozley, Rev.Dr. Warburton, the Revs. J. Dodd, Jas. H. Ashhurst, O. Ogle, G. T. Cooke, H. R. Bramley (Vicar of Horspath), G. Branson and H. C. Ogle (Fellows of Magdalen), and Dr Tuckwell, Mrs. Clerke, Mrs. Bulley, Mrs. Glanville, Mrs. O. Ogle, Mrs. Parsons, Miss Rigaud, Mr. and Mrs. Combe, Mrs. F. Symonds and the Misses Symonds, Mr. Taunton, Mr. Wingfield, &c.
The Rev. OCTAVIUS OGLE said he should ask those present to assent to a resolution which he had to propose. He wished, however, in the first place to remind them that this was a Home and not a Hospital, and among the list of names of the promoters of it there was one he wished to do honour to. It was that of a lady whose name had been given in memory of her munificence to that Home, of whom so long as that building stood, there would be a monument for her kindness in doing what she had done. He was sure that they all regretted that she was not present to join in the ceremony, but he was certain that the work that had been begun was completely in accordance with what was known to be her dearest wishes. (Applause.) He also wished to do honour to the name of another person who had passed away since that work began, and who assisted them in completing it more than any other one man had done – he meant the late Mr. Parsons. (Applause.) That gentleman had happily left one behind to finish the work. There were few things more burdensome to a man than to mention his praises in his presence, and he should therefore forbear to say anything more than to ask them to join with him in thanking Archdeacon Clerke for his tasks through that day, and for the kind interest he had throughout shown in the promotion of the Wingfield Convalescent Home, and also for his kindness in laying the foundation-stone of that building on Whit-Monday last. The motion was carried with acclamation. Archdeacon CLERKE said he was exceedingly gratified at the way in which the mention of his name was received. What Mr. Ogle had said was perfectly true. He had felt a deep interest in that work; it was undertaking a considerably novelty, but it was carrying out the true wishes of one whom he knew well. Mrs. Wingfield was one of the two ladies who rendered him great assistance in carrying out a good work while he was Vicar of St. Mary Magdalen. The other lady was Mrs. Morrell. Both of these ladies had left behind them an example which he hoped would be long remembered, and have great influence. There was one thing that had occurred to him with regard to this building, and that was that he hoped he never should see any of those who attended the opening of it that day inside it as patients; he trusted that they would all enjoy good health. He could not conceive any truer act of charity than the establishment of that Home for the reception and restoration to perfect health of those who had suffered from any disease and had been partially cured. The want of such a Home had been very much felt. It would be a great aid to the Radcliffe Infirmary, as the Governors of that Institution would be able to remove their patients to that Home before they could otherwise discharge them. Therefore, by doing this they would be assisting the Infirmary in the good work of receiving the sick and afflicted. He returned them his sincere thanks for the compliment they had paid him, and reminded them that annual subscriptions were necessary for the support of that Institution, and which he trusted would be forthcoming. The patients who were admitted into it must be well fed, and the mode in which they would be treated would incur considerable expense. He hoped that subscriptions would soon be sufficient to enable them to add an airing ground to the premises. They had, however, sufficient space to begin that, but the great point was to secure a larger space for that purpose. He could not conclude without thanking Mr. Rigaud for the way in which he had laboured in carrying out this great work, and he supposed that in a very few days that Home would be occupied by convalescents. He came up there to see it a few days ago, and he was so struck with the salubrity of the air that he told the Matron that he could almost wish to be the first patient himself. (Laughter.) The building also was admirably arranged. He concluded by thanking them for the compliment they had paid him. Above: Map showing the Wingfield Convalescent Home in 1876 and below in 1899: no changes appear to have been made during this period. 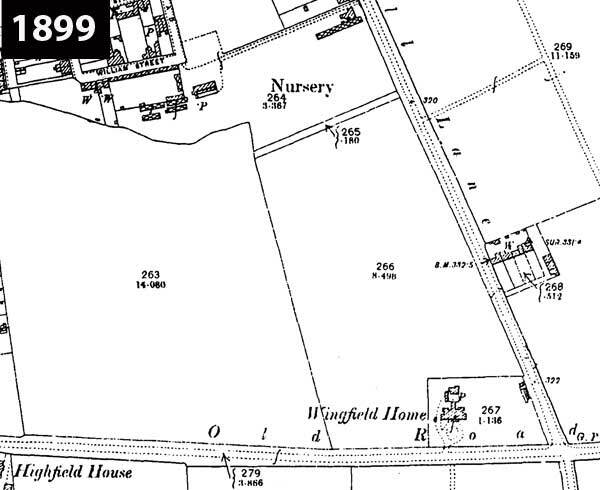 At the time of the 1911 census, John Woolfitt (70) was Steward of the Wingfield Convalescent Home, and lived there with his wife Mary Elizabeth (62), who was the Stewardess. They were then looking after eight patients, ranging in age from 14 to 62. 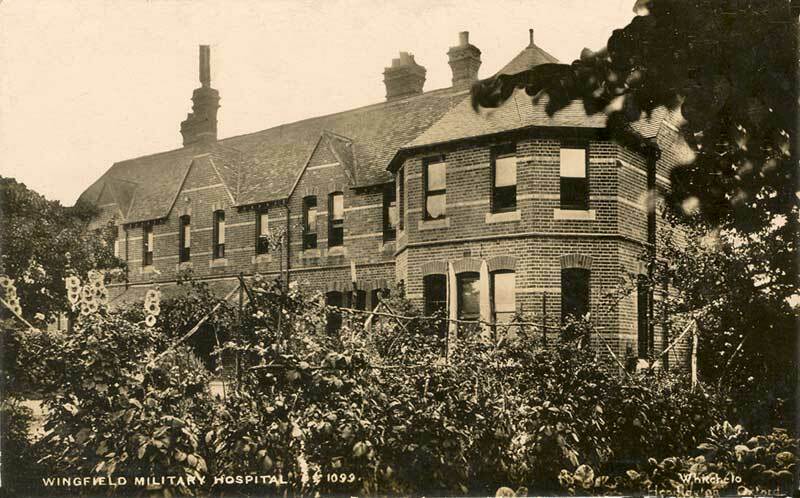 In 1918 the commandant of the hospital, Miss K. J. D. Feilden of High Wall, Pullen’s Lane, paid for additional buildings on land on Old Road to the west, and the site became the 100-bed Wingfield Military Hospital, shown below in 1921. By 1922, there were fewer war pensioners, and crippled children were being admitted. 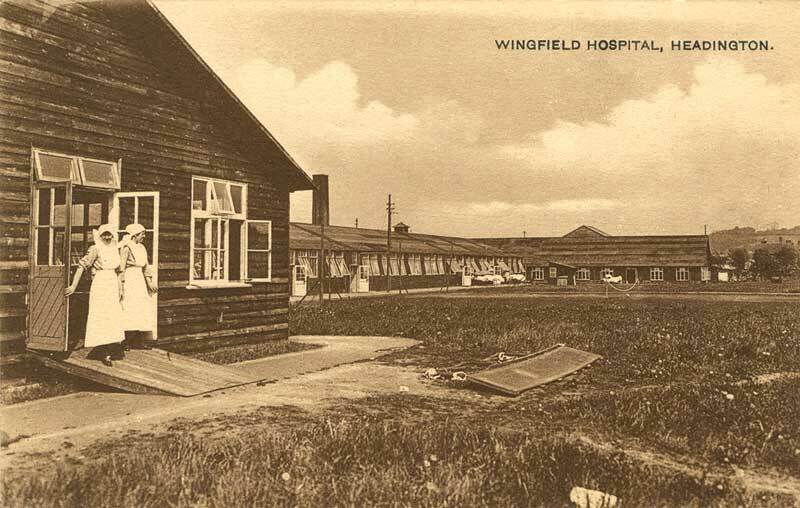 In that year it became the Wingfield Orthopaedic Hospital. In the summer of 1930 a man called at the house of Dr Gathorne Girdlestone, introducing himself as “Morris of the car factory” and gave his wife a cheque for £1,000 to help keep the Wingfield Hospital in good repair. 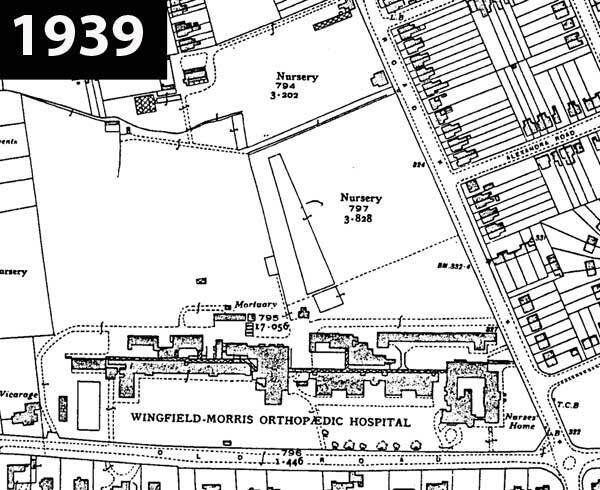 In 1931 the then Sir William Morris gave a further sum of £70,000, and it was rebuilt and renamed the Wingfield-Morris Orthopaedic Hospital in 1933. 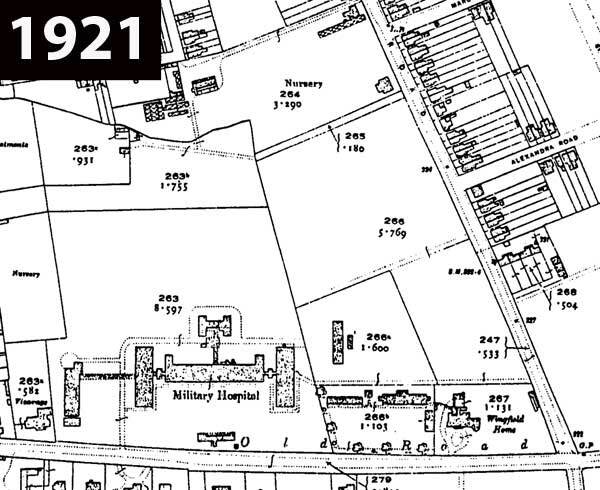 The 1939 map below shows further expansion of the hospital, with the old convalescent home now extended with the sing shown above and converted into a nurses' home. William Morris became Lord Nuffield in 1938, but it was not until 1955 that the name of the hospital was changed to the Nuffield Orthopaedic Centre, with the memory of Wingfield dropped. The hospital extended northwards to include the site of a former nursery, and its main entrance has been on Windmill Road rather than Old Road since the 1980s. The Nuffield Orthopaedic Centre was rebuilt at a cost of £35 million between 2002 and 2005. 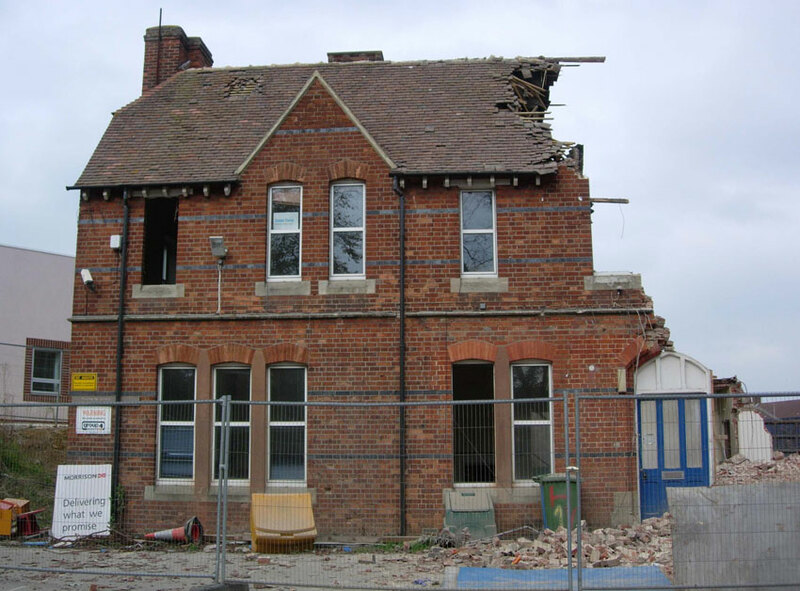 In 2006 the former Wingfield Convalescent Home was demolished to make way for its new car-park. I have looked at all the papers on this file and other relevant information and have carefully considered the architectural and historic interest of this case. In my view the criteria for listing are not fulfilled. The Wingfield Convalescent Home was built in 1872 to the designs of Oxford architect William Wilkinson. 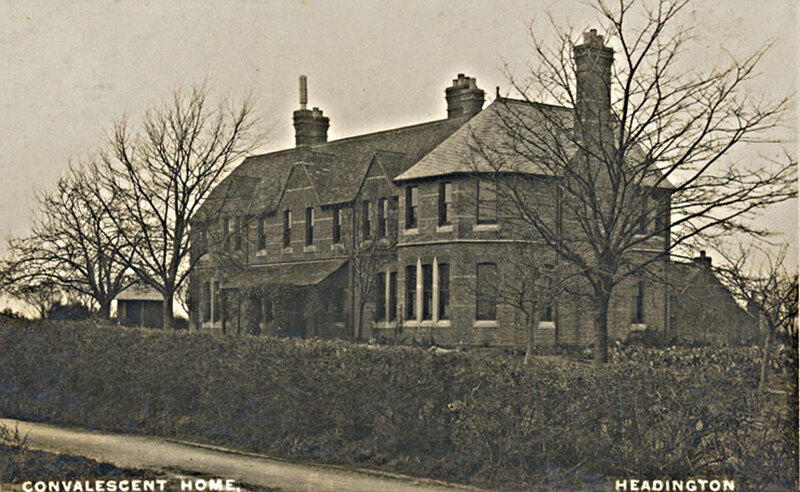 The Home originally accommodated eight patients, and was built in part to support Oxford’s Radcliffe Infirmary, from where patients could be moved to the Home to recover in a healthy environment before being fully discharged. The 1872 building is a two-storey house of red brick with simple black brick banding. The 10-bay front has three gables and a canted projection to the far right. There may have been a verandah along the ground floor front, as described in the a contemporary Builder article, but this no longer survives. As the maps show, this building was incorporated into later developments on the site, and the former Home is now part of a quadrangle with the 1930s nurses’ home. In 1916, a military hospital of wooden huts was built in the grounds, and none of these survive. 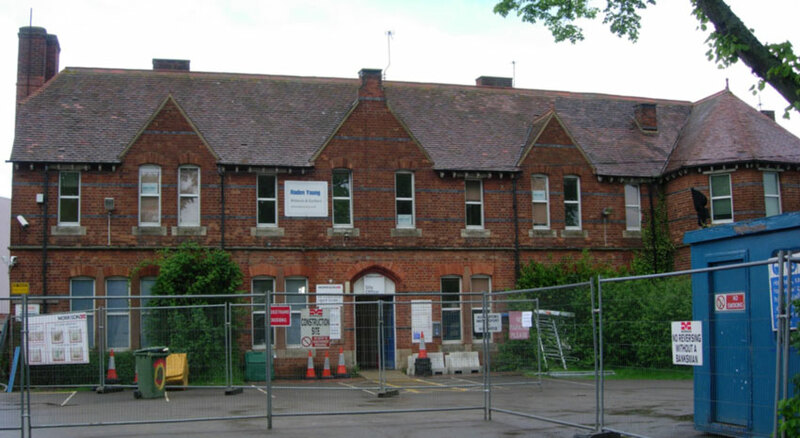 This was replaced between 1931–9, as the Wingfield-Morris Orthopaedic Hospital, and these buildings now comprise much of the present site. The incorporation of the 1872 Home into the 1930s developments altered the plan form of what was a discrete building comprising a main range with connecting wing to a smaller rear range. Only the main elevation survives as built in the 1870s. This elevation certainly has a domestic quality – convalescent homes were often intended to be non-institutional in style, to suit the more relaxed recovery they were to encourage – but it is relatively plain. The ground and first floor windows do not align, and the removal of the verandah has left only the simple banding and gables to break up the long facade. Wilkinson is an important C19 Oxford architect but this building does not live up to his skilful hand. The convalescent home as a building type was established in the mid-C19, with the 1840s Metropolitan Convalescent Institution. The type developed much more fully from the 1870s, often through philanthropy, which was the case at Wingfield. The Wingfield Home was therefore part of the early development of the building type, but it was not particularly innovative in a national context. Many of the late-C19 convalescent homes which are listed have particular architectural interest and completeness, such as the Gothic 1865–7 former Herbert Memorial Convalescent Home designed by T. H. Wyatt, the Italianate 1892 Pearn Convalescent Home, or the Gothic style 1861 former Home in Torquay by J. W. Rowell. The Wingfield Home lacks this kind of architectural interest to be considered special in a national context, and it does not have sufficient survival of original form; it is recommended as not listable.